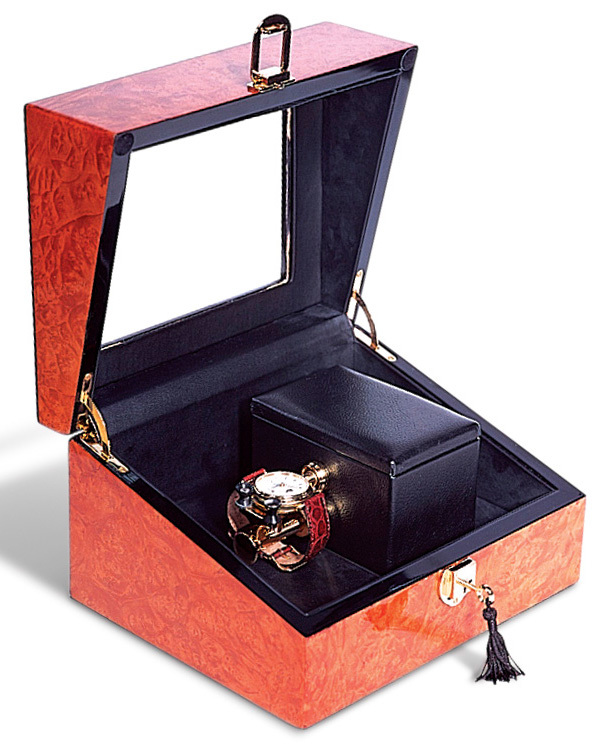 The SEMPRE watchwinder is the first and only watch winding device that will keep virtually any hand-wound mechanical watch with an accessible crown fully wound when unworn. This patented design is truly unique in that it replicates the human action of finger winding a watch by rotating the winding crown similarly in a clockwise direction. The SEMPRE design substitutes a mechanical finger arrangement, called a "collet", which grasps the watchs crown securely and rotates it. Several different size collets are provided to fit any watch crown diameter from 3 to 9 millimeters. These collets are custom made of acetal plastic to prevent scratching or marring of polished watchcase surfaces. the SEMPRE winder monitors the electrical current drawn by the gear motor as it rotates. The amount of force required to wind the mainspring of a mechanical watch, known as the winding torque, increases as the watch is being wound. As the torque increases, the drive motor draws more current. The control circuit is user-adjustable to shutdown the system when it senses that the current has reached a pre-set limit, one which is well below the maximum torque that the watch mainspring can handle. To prevent "overbanking" the drive reverses the crown momentarily after shutdown. AC/DC Switch.